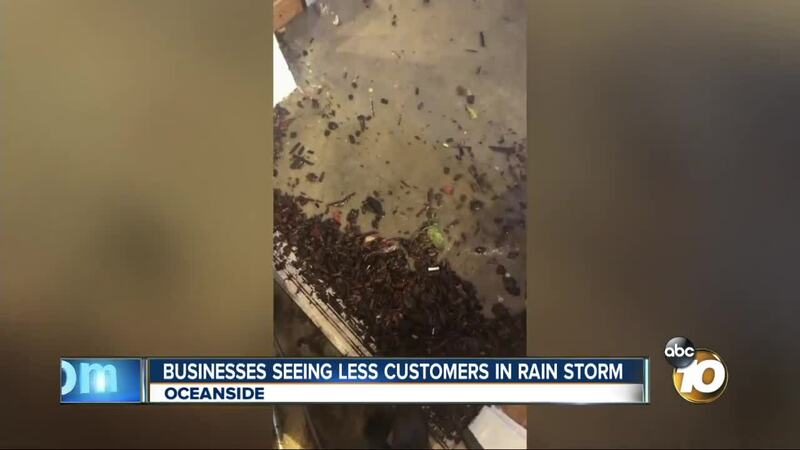 OCEANSIDE, Calif. (KGTV) - Oceanside businesses tell 10News they saw fewer customers coming in Sunday as a rain storm rolled in. The foreboding clouds brought back memories of December's storm that flooded a block of businesses on Coast Highway near Vista Way. "It was pretty wild," Savannah Hemstreet, store manager at Gypsy Den Boutique, said. She shared videos showing waves of water lapping at their door, which they barricaded with a rug. She felt reassured as Sunday's rain rolled in, knowing sandbags sat on the front sidewalk ready to protect the store if the need arose. While they didn't see any physical damage from this storm, they felt still felt the impact. "It's hard for customers to come down here, or feel comfortable coming down here especially with their cars because it's like flooded and stuff because you don't want to get stuck," she said. Instead of venturing out, locals and tourists stay in when they know a storm is coming, Hemstreet said. "They want it to be sunny and stuff but it's been rainy for the past few days so hopefully the weather gets better," Hemstreet said.